What a weekend! I honestly can’t believe we have walked away with another 50 points after an incredible double in two very different races. I always get a warm feeling driving under the tunnel and into the paddock at Assen and it didn’t disappoint this year. The weekend got off to a good start and I had a pretty smooth Friday, setting the pace in the sessions and marking our intentions for the weekend. Next up was Superpole, and I put one hell of a lap together, possibly one of the cleanest of my career, for pole position. Unfortunately, it would be what happened next that was the talking point of the weekend. I rolled out of my second lap and was checking around for traffic when at turn seven I got in the way of Chaz completely unintentionally. What happened next was ridiculous. After being punched on the track, I got back to parc ferme, left things a little and offered some words to Chaz. He went off on one, swearing and all sorts as I tried to remain calm. All I wanted to do was smooth things as he is a guy that I respect but even after his little dummy spat, I offered him an apology and my hand which he rejected. After, I got asked to go to race direction and checked all the footage with them and agreed that I got in his way. It was clear to see that I was a long way off my line but he uses a pretty wide line in that corner. I got a three position grid penalty which meant I started fourth. What upset me most over the whole thing was Chaz tried to make me out to be a bad sport like I’d done it on purpose! I could go on and on about it, but I prefer to keep my opinions about Chaz to myself and hold my head high. Let’s move on. That set things up nicely for a showdown in the race and it worked out great. Both Chaz and Tom found some pace so it was a close battle but I rode shot gun for pretty much the whole race working out where I could pass. I made my moves with five to go but he made block passes straightaway. I bided my time. I could see he was so wide in turn three a few times, so I rode right inside him and took the lead and put my head down. Unfortunately for him his bike stopped entering the last lap but I am confident that we would have taken the win regardless. Race 2 was a completely different story. The temperature increased enough to use the soft rear tyre but the wind also increased a lot making riding the bike very difficult. Starting from ninth, I made a good start and got to the front pretty quickly and put my head down. I had almost a two second gap when I had a huge moment in turn 11 when a gust of wind caught me and I almost went down. After that I rolled the gas a bit and rode to my pit board to see it was only Tom behind, and that my rhythm was taking us away from Chaz. With two laps to go I stepped it up a bit for the win. I wasn't sure if he was right on my rear in the last sector but I covered the inside in the final chicane anyway. It completely messed up my drive and gave Tom a slingshot, it was still not enough though and we won again to take another 25 points. Looking back, it was a great weekend for Kawasaki. 1-2 in both races for KRT and Kenan and Toprak won in the Supersport and Superstock classes, so it’s fair to say Kawasaki bossed the Netherlands. And also for me, I’ve always away with a lap record two race wins and increased our championship lead. My best lap from Superpole officially stands too, so Tom, if you’re reading this, you can deliver me the Tissot watch in Imola? Apparently the circuit attendance was well up on last year which was easy to see. I always enjoy taking in the atmosphere there, especially around the Gert Timmer chicane area. 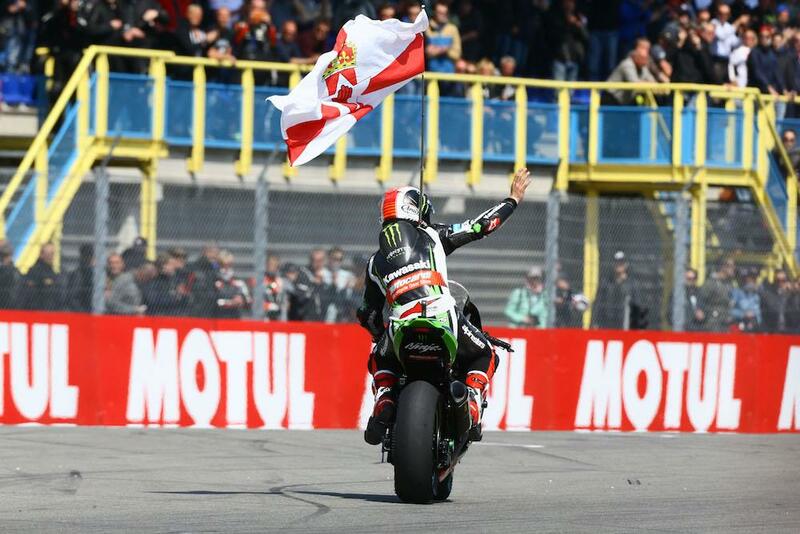 Freshly crowned three-time World Superbike Champion and Kawasaki Racing Team rider.